Whose day will it be? Today is crucial, and could go very badly. The Egyptian gangster regime and its backers have clearly decided to use maximum force to end the popular challenge. At 12.34 this morning, Egypt’s entire internet service was closed down – the largest shutdown in history. Mobile phone services have also been suspended, and al-Jazeera has been taken off the Egyptian air. An al-Jazeera journalist has been beaten up by regime thugs. There are reports that French and British journalists have also been beaten or detained. A CNN crew have had their cameras smashed. Obviously, news is harder to come by today. Last night senior members of the Muslim Brotherhood were arrested (see Jonathan Wright’s reflection on the Brotherhood role). Now it seems Muhammad al-Baradei has been arrested after leading a protest in Giza. 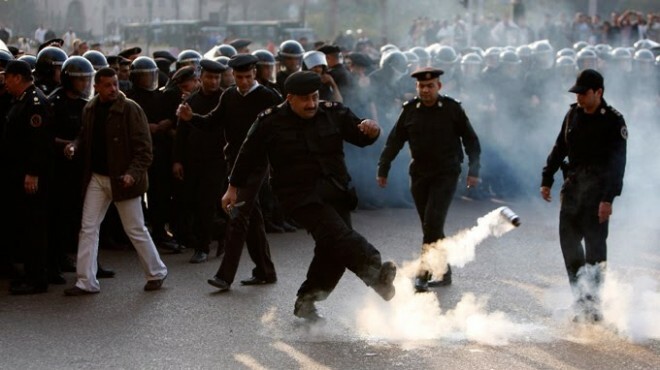 Protests have erupted in Cairo, in Sinai’s al-Arish, in Minya and Assiut in upper Egypt, in Ismailiya, in Alexandria. Roads leading to Suez, where regime forces have lost control, have been closed. In the circumstances, protestors are remarkably well-organised. And a few reports are coming through of soldiers (in Suez and Alexandria) refusing to attack the people. Latest: 20,000 people have taken over Qasr el-Nil bridge in central Cairo. And Ayman Nour of the Ghad Party is in intensive care after being beaten by police. If the Egyptian people are successful in the coming few days, Mubarak may well choose to hand power to the military. If revolutionary momentum proves unstoppable, as it has done in Tunisia, then a more democratic outcome can be expected. Egypt is perhaps the key Arab state – it’s certainly the most densely populated and the most strategiacally located. America has invested billions in Mubarak’s regime. Israel’s security – and Palestine’s subjugation – is dependent on Mubarak’s gangster state. The stakes could not be higher. Demonstrations will be held outside Egyptian embassies in Western capitals tomorrow (Saturday). If you want to further support the Egyptians, demonstrate at US embassies too, to demand America stops providing Mubarak with bullets, tear gas, money and political support (or call your representatives and make a noise). Egypt doesn’t want Mubarak’s reforms. They want an end to Mubarak’s regime.